Well here is Eve from the Black Cat Anime Series. I finally decided to edit her colours. I hope I got them right. 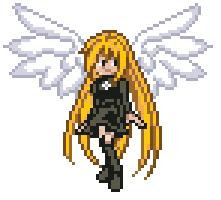 Her sprite wasn't the best- her face ended up being a bit wonky on me!! You can find a finished sprite here. I have also completed a Hellsing Logo...pattern can be found here. More Naruto Patterns added to the web page.